COD – Cash on Delivery – Collect Call: Whatever terminology your company uses, these are the calls most service managers are looking for. These are products with zero warranty and the customer is responsible for the total cost. This allows a service company to charge normal rates which should lead to a profit. COD work ideally comes from brand awareness with your customers. Remembering you from a previous visit, large-scale marketing like decals on your truck, and a referral from a friend/family member can all lead to getting a repair job at a low to zero cost. COD work can also have fees attached to it from PPC, content generation, lead services like Thumbtack, and other marketing efforts. Property Management – Landlord – Third Party: Your company sets up a special rate to take care of service work for a specific property management company. Whether it’s a flat rate for the total work or special billing terms, the hope is that the exchange in volume will help balance the loss in individual call revenue. OEM Warranty: The Original Equipment Manufacturer’s warranty is typically for work on a product that is less than a year old. All labor rates are paid for by the OEM. Part costs are typically reimbursed and labor is paid only 1 time. So when a 2nd trip is needed, the service company is usually operating at a loss due to the additional trip(s). The OEM has to approve specific companies to authorized to complete OEM Warranty repairs. Jobs can arrive directly from the OEM customer support staff. Others prefer the service company/dealer being the first line of support. Great opportunities to earn future COD business. Insurance – Home Warranties – Extended Warranties: This covers a large variety of different companies that extend the warranty past the original manufacturer’s. They can pay the service company a one-time flat rate charge like an OEM warranty repair or it can be based strictly on their COD rates. It’s up to the warranty provider and the service company to work these details out. Like OEM Warranty, a lot of these jobs are paying lower than normal market rates and many service companies operate at a loss on these calls when making multiple trips. 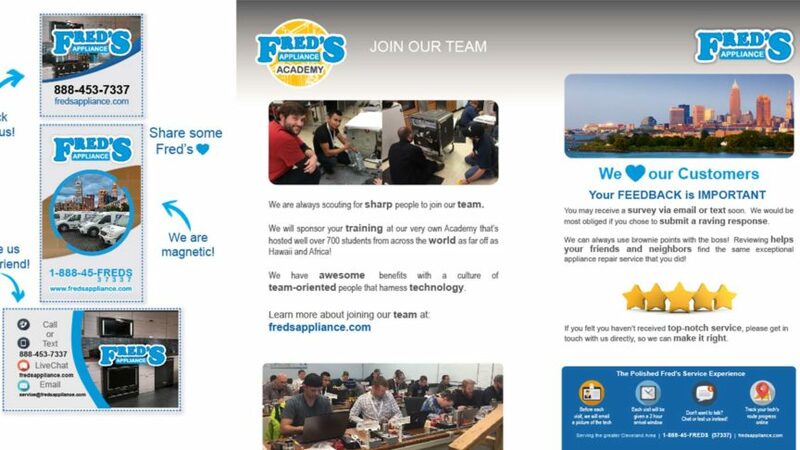 Like OEM warranty, this is an opportunity to earn future COD business. Keep in mind that when a service provider is referred to a customer for a warranty repair, most customers are unaware of this arrangement. To the average consumer, you are the “Samsung guy” or the “Whirlpool repair person”. Most service companies are not marketing their own brand effectively enough to be a household name in their service territory so how can the average customer be expected to remember who you are after hearing your name one time by a Customer Service Representative? Bottom line: It’s up to you and your company to leave a lasting impression. These methods work for 2-man companies to 50+ technician operations. Nearly everything below is either about setting a new company policy, establishing a new operational workflow, or by making smart investments in your long-term marketing. Is your office staff responsive to the customer after receiving an OEM Warranty repair referral? You should be receiving these dispatches in real-time to your office allowing your support staff to respond within minutes of it arriving. Confirming all the information is accurate and that the date of service is correct. Don’t assume the OEM is doing their job correctly, you are the one providing the stellar service so you need to ensure the customer’s info is correct. Do you offer texting and web chat services? During the confirmation call, let them know about these features! Let your customers communicate how they want to communicate. Are you pre-screening your service calls? If a part is needed to complete the repair based on the complaint, there is no point in sending a technician out just to state in person that a part is needed. Getting pics and videos from a consumer can make a big difference. Have your support staff ask when taking the call about pics and videos of the issue. Your website should allow for secure submissions of various file types. If not, get on your web admin! There could be a service bulletin on a specific complaint, with OEM warranty jobs especially. This does take some skill and experience to accomplish, but it’s not just about saving money for the company by avoiding an unnecessary trip. It’s in the customer’s best interest. Once an OEM warranty repair has had the details confirmed with the customer, it should be immediately assigned to the pre-screener/triage staff. Any delay could delay the repair from being completed. Be proactive instead of reactive. If you wait until the day of the appointment to pre-screen, that only extends the issue for the customer. That’s an easy way to get a negative review online. Is your service vehicle branded? Are you wearing a company uniform? Are you protecting the floors of the home using booties? To some, this can sound like a no-brainer move, but the impact is too big not to mention. You are a stranger to the customer. If you show up in an unmarked van, wearing unmarked clothing, you are asking for trouble. Make sure you get started right with the customer when you arrive at their home. Wearing booties shows you care about the customer’s home. This should be mandatory at your company. Use a leak detection mat after working on products with water. These mats should be disposable and branded. A traditional invoice can provide the basic info needed for your service company but we recommend using a Leave Behind Card for every job instead. This is something that should be professionally designed, printed, and assembled. What does a good Leave Behind Card need? Current Status of the job – customer needs to know if the job is done or not in writing. You should have an area to fill out notating your return visit. More on this below. Saftey Checklist – covering a variety of environmental issues. 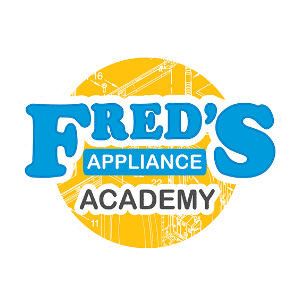 Even though as an appliance repair technician, we are not normally responsible for the environment the appliance is in, it is still something we should be providing guidance to the customer on. We are the professionals in the home, we need to make sure our customers know of any potential issues in their home that we may notice. Invoice/Receipt – We recommend sending the actual receipt electronically, but we want to ensure, for our anti-technology customers, that we have an option to hand-write the receipt. Magnets, business cards, stickers should all be attached to the LBC. Makes it easier to stay organized in your truck while also ensuring every single customer receives this stuff. Especially the magnet. Don’t let your customer’s hunt you down when something breaks, let the magnet guide them back to you. Are you looking to hire? Advertise it on your LBC! Everyone has appliances, so you never know who you could be interacting with on the road. You could end up servicing a future appliance repair technician. No one expects your current technicians to become recruiters, but mentioning this on your LBC is a way to ensure every customer knows about it. Reviews. Encourage your customers to leave feedback about your service online. The only way to combat negative reviews is to get your happy customer’s to speak up. The easiest way to do this is simply to ask each one. Mention any other new features or promotions that help you stand out from your competition. So all of the above is accomplished when leaving an LBC with each customer. This is a great way to get your company branding in front of the customer. If a spouse was not home during the repair, the LBC will give them a quick rundown on what happened and if the job is not complete and what happens next. To the spouse that wasn’t home, this will be the only interaction with your company. For companies that are not using an LBC, the spouse may get a hard-to-read yellowish copy of a 3-ply paper invoice. Yuck. That’s what your competition is doing, you need to stand out if you want to earn that future COD business. Make sure you keep reviewing and updating your LBC design. Your business is always improving and changing, keep your customers up-to-date. In the LBC section above, we briefly mentioned the importance of updating the status of the job and ensuring that you notate your return visit. This is a big deal for customers. The days of getting calls from your customers asking “Where are my parts?” When are you coming back?” are over. To eliminate this, we recommend rescheduling your return visit while still in the home. Dispatch software and shipping parts direct to the customer is a big help in accomplishing this but these subjects will be saved for a future blog post. Your technicians should be looking up their own parts(to ensure the correct part is ordered) and while doing so, they can confirm the availability of the part. If the part is in stock with your distributor, you can schedule the return visit for the day after the part is expected to arrive. Customers are always disappointed when you have to make a 2nd trip, beyond the fact that your company is not as profitable when making multiple trips. By providing the return date before you leave, you are more likely to close a COD job but more importantly, you will leave a stellar impression on the customer. Your company appears to be organized and ready to do whatever it takes to solve this issue ASAP. Your customers and your bottom line will appreciate this policy change. Parts are actually ordered by our support staff. The support staff follows up with the orders via shipment tracking to confirm delivery. For any prospective online customer to determine if they should use your service company over another, customer reviews are going to play a large role in making their decision. It’s also one more opportunity to create brand awareness with your warranty customers. Again, you are the “whirlpool repair person”, but asking for a review after the job is completed by email or SMS gives your company more exposure to this new customer. Doing the review requests by email or SMS makes it easy for your customers. If you want the happy customers to speak up, you need to make it as easy as possible. Using Fluid Local, you can take this a step further and increase your search engine presence with every completed review. We hope this overview will help and inspire your company to work on the little details of field service repair in appliances. At Fluid Services, we care about our clients’ long-term growth. By following these suggestions, your team will leave a positive impression on every customer you serve, in or out of warranty. Not only will you create a great customer experience, the morale of your staff will increase. Happier customers lead to more COD work and happier employees lead to better productivity.